Modern 2 bedroom exceptionally clean caravan on the lovely Hoburne 5* caravan Park with great amenities. Sleeps 4.
with beach themed accessories. Microwave/full size oven/fridge/freezer/radiator centrally heated throughout. Large sunny gated decked area for sun worshippers. entertainment/adults evening entertainment/tennis courts/gym/crazy golf/large outdoor play area. 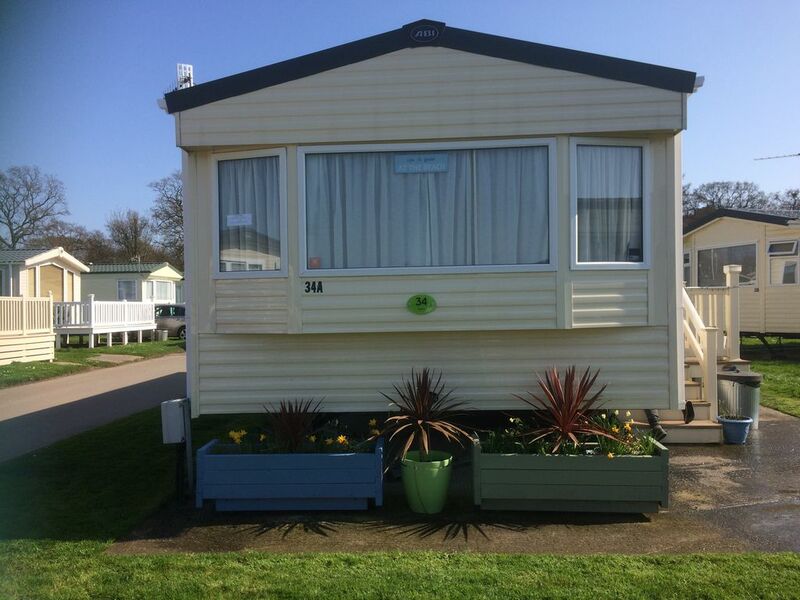 The site is well maintained with plenty of flower beds and grassed areas around the caravans. Site is within walking distance to Avon Beach/Steamers Point. Also on a local bus route for buses into Christchurch/Highcliffe/Bournemouth/Hengistbury Head. Large local convenience store nearby + large supermarket, lots of restaurants and shops within nearby area. Duvets, pillows and T/towels are provided but you will need to bring duvet covers, sheets, pillow cases and towels with you. Hoburne Park Club Passes are available from reception on arrival or beforehand by contacting them direct at a cost of approx £40.00 per family of 4. Please note we need to obtain all your details before you arrive to give to reception, your passes will be ready for you on arrival..
As it is our family caravan we do ask our guests to leave it in the condition found on arrival as we sometimes have very short turn around for our guests and we do the cleaning ourselves in-between working and we hope our guests can appreciate this. We are currently live in Southbourne, Dorset which is very handy if guests have any problems with the caravan as we can be there very quickly. We bought the caravan as we have now downsized so much that our grandchildren cannot stay with us in Southbourne so we bought the caravan mainly for them to come and visit and stay with us as family are very important to us. We both still work but are nearing retirement so are looking to enjoy more time by the sea and at the caravan in the years to come. As we said previously we bought the caravan to house our family's and for them to use for holiday breaks. We liked the site as its well maintained and has a very friendly atmosphere. The children we feel are very safe here. Great clubhouse and children's club. Good entertainment, great restaurant, swimming pool, play equipment + its within walking distance to the beach. Also very near the New Forest for great walks and wildlife. We found the caravan very clean, warm, comfortable and well equipped and the Hoburne Park is one of the best we have stayed on for facilities and location. We were disappointed that the park information in the caravan was out of date; we expected to pay £1 each for crazy golf as per the leaflet, but the price had increased to £2.50 each. Only a small matter but having paid £40 to access park facilities thought this was a bit steep. We did find it a bit irritating to have to supply bedding and towels and therefore have to make and strip beds on arrival and departure. It’s just more stuff to pack and things to have to do when you want to relax. Similarly, being expected to clean before leaving took the shine off the whole stay - and being supplied with a broken vacuum cleaner was frustrating to say the least. To be fair, the owner is completely open and upfront about the cleaning expectations and need to supply own linen so they cannot be faulted for that. It’s just personal preference to not have to do these things. We would rather pay extra and have the owners provide linen and a cleaner! If you have no objection to the minor matters referred to, we would definitely recommend both the accommodation and the park. Hi Maggie - thank you for your review. We totally agree that the crazy golf is overpriced considering what you paid already but unfortunately we have no control over this. Perhaps you could express this with an email direct to Hoburne Park. Again we apologise that the hoover pipe was broken, my cleaner only let us know after she had cleaned, this is a fairly new hoover and will be mended asap. Unfortunately previous renters were too heavy handed with it. When we ask our renters t leave the caravan as they find it we obviously expect the basics to be done such as leaving the toilets clean, worktops clean etc which we ourselves do wherever we stay. Because this is our family caravan we do expect quite high standards so that we can keep our caravan nice for the next renters. We still do a thorough clean after each rental and we pride ourselves on the cleanliness of our caravan for which we have had lots of positive reviews. Again if we provide linen then our costs to the renters would go up dramatically due to electricity costs and drying costs etc. Most of the caravan owners that rent out caravans on the this site and others do not provide linen. I hope this hasn't put you off coming to stay with us again in the future. Spacious, well equipped and comfortable. A very well managed site with good facilities, and no noise after 11pm! There is a pleasant 10 minute walk to a nice beach with views of 'The Needles' on the Isle of Wight. The New Forest and other attractions are on your doorstep. Perfect. So glad you enjoyed your stay, we always find the site quiet even in the summer months. We would love to welcome you back again. Clean and modern caravan, plenty of room, fantastic location, we had 4 nights of great family time, went off exploring, visited Weymouth, Poole, Bournemouth, Christchurch too, went crabbing off mudeford pier, relaxed on nearby Avon beach, the weather was not what was expected from august but that's not anyone's fault but rain or sun there was always something to do. It's a perfect place for exploring, you've major supermarkets minutes away, we would definitely go back and stay here again without issue and will recommend to friends and family alike. Was our first experience of using this site to book and we are glad we did. Hi Edward - if you are interested in booking again for our caravan at Hoburne Park this summer 2018 please do not hesitate to contact us again as we still have some availability. This is a lovely caravan, which comfortable accommodated my family of 2 adults, 2 older children and 2 toddlers. It was spotlessly clean, with a nice sized lounge with plenty of seating and two bedrooms. There is an en-suite wc and separate shower room and toilet and the shower was nice and hot and powerful. The kitchen etc is well equipped with all you need to self cater, and the owners provide some basics to get you started. You need to bring your own towels for showering and the beach, plus linen for the beds but duvets pillows etc are all provided and the beds were comfortable. The site is well kept, the pool was inviting and although we didn't go down for any evening entertainment the toddlers enjoyed seeing the parks characters out and about during the day. The older children very much enjoyed collecting their tickets from the small amusements that are on site; which was great for us as it gave us some time in the evening to put the babies to bed quietly. The caravan is a short 20 minute walk to the excellent Avon Beach, and maybe 35 minutes to Mudeford Quay for crabbing. If you are looking for somewhere clean, convenient and comfortable near Christchurch and surrounding areas then book this caravan now - it is perfect for the quintessentially English seaside break. We loved it and only wish we could have stayed longer. If you would like to book with us again for Summer 2018 at Hoburne Park we still have some availability for Spring/Summer left. Please contact us again. We hope you enjoyed your stay and look forward to seeing you again. Sehr gepflegt, gut eingerichtet, schön gelegen für Ausflüge. Zum Strand sind es nur 10 Minuten zu Fuß. Die Angebote auf der Anlage (Pool, Minigolf, Café...) sind prima. Die beiden Einzelbetten sind sehr schmal, für Kinder gut geeignet, für Erwachsene nur bedingt. Sehr freundliche Betreuung, schnelle Antwort auf Fragen.